Do you sometimes have trouble remembering what you need to buy when you are out grocery shopping? Do you grow tired of writing out the same list each time you need to shop? If you are looking to make grocery shopping easier, if you want to save time when prepping for the shopping, then this basic grocery shopping list template will help you do that. 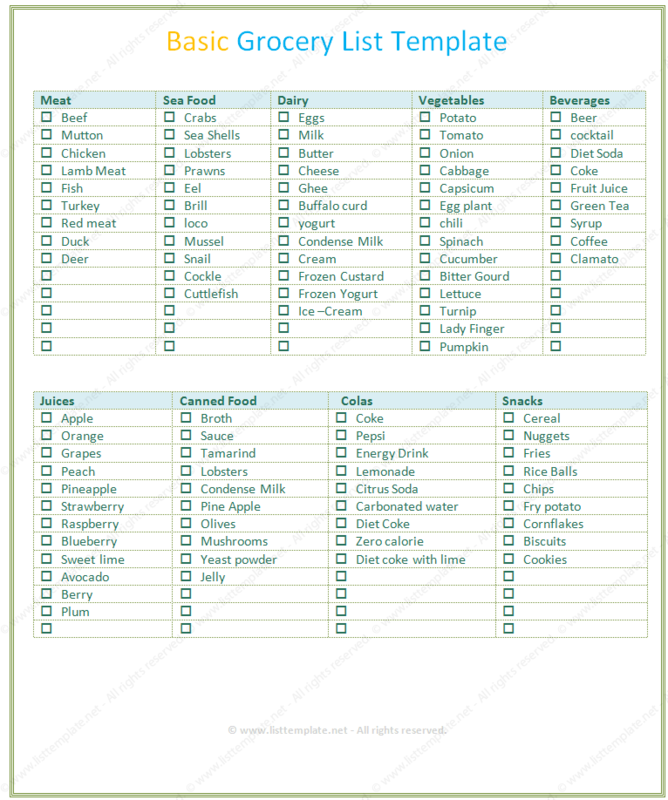 This basic grocery list template includes a list of all of the basic items that most people pick up when they are grocery shopping – items such as beef, sauce, onions, and cereal. The food items are organized by categories, which makes it easy for you to manage your grocery items in the perfect way. This grocery list template was created in Microsoft Word®, and it is easy to print and use. Each of the grocery items includes a check box next to it, so that you can mark it off when you have added it to your cart.